Description: This adorable Puffalump Puppy was one of the first six Puffalumps made by Fisher-Price, see #8000 Puffalumps Assortment for a list of the other five first Puffalumps. The Puppy was originally introduced as a light blue dog wearing a light blue one-piece jumper outfit. Puppy was also available in dark blue with a dark blue jumper. Sometime during it's production, though never pictured in the Fisher-Price dealer catalogues, the Puppy was also made in Pink/Magenta with a matching jumper, and in peach with a matching jumper. The jumper worn by the blue and pink/magenta bears are styled the same, simply colored differently. The jumper worn by the peach-colored bear is styled a bit differently...it is the same outfit worn by #8006 Bear Cub. NOTE: In 2006 Fisher-Price reintroduced a Puffalump Assortment that includes remakes of the #8001 White Cow, #8002 Yellow Kitten, #8003 Blue Puppy, #8004 Pink Bunny, #8006 Peach Bear Cub and #8014 Duck. As with the originals, these remakes include accessory clothing and the Puffalump logo on bottom of their right foot. Apparently the only difference between the remakes and originals is the remakes have a red/white Fisher-Price awning logo on the box and on the Puffalump's tush tag. FPT10169 - Blue featherlight stuffed Puffalump puppy that is made of extra soft parachute-type fabric. Puppy has white yarn "hair" sprouts on top of his head. He has long droopy ears, brown stitched eyes, a large rounded pink velvety nose, and a large red stitched smile. He has blue arms with stitched "paws", and blue legs with white pads on the bottom of his feet. He has the Puffalump trademark symbol on the bottom of his left foot, click here for a photo of the symbol. FPT10150 - Blue one-piece romper outfit with a white pleated bib-shaped chest. The jumper has sleeves with folded cuffs on the ends, the blue collar has a thin pink trim on the edge, matching the pink trim edge that borders the bib on the chest. The jumper has cuffed leg holes. FPT20036 - Small square paperback booklet titled "My Puffalump Keepsake Book". The booklet has a blue cover with a picture of a blue Puffalump puppy and white cow in a balloon. The booklet has pages for children to write the name of their Puffalump, favorite activities, first outing, etc. Measures 3-1/2" wide x 4" high. FPT10170 - Pink/magenta featherlight stuffed Puffalump puppy that is made of extra soft parachute-type fabric. Puppy has white yarn "hair" sprouts on top of his head. He has long droopy ears, brown stitched eyes, a large rounded pink velvety nose, and a large stitched smile. He has pink/magenta arms with stitched "paws", and pink/magenta legs with white pads on the bottom of his feet. He has the Puffalump trademark symbol on the bottom of his left foot, click here for a photo of the symbol. FPT10171 - Pink one-piece romper outfit with a white pleated bib-shaped chest. The jumper has sleeves with a thin white trim on the ends, the white collar has a thin pink trim on the edge, matching the pink trim edge that borders the bib on the chest. The jumper has cuffed leg holes. 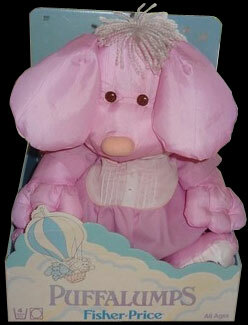 FPT10172 - Peach featherlight stuffed Puffalump puppy that is made of extra soft parachute-type fabric. Puppy has white yarn "hair" sprouts on top of his head. He has long droopy ears, brown stitched eyes, a large rounded pink velvety nose, and a large pink stitched smile. He has peach arms with stitched "paws", and peach legs with white pads on the bottom of his feet. He has the Puffalump trademark symbol on the bottom of his left foot, click here for a photo of the symbol. FPT10148 - Peach colored satin-like "shorts" with an attached white short-sleeve shirt. The shorts have 2 round white embroidered buttons on the front. The shirt has 3 pleats on the front with 3 peach stitched dot "buttons" on the center pleat, and a white collar with peach on the edge. The back of the outfit has two Velcro® brand fasteners. FP8003BOXA1986 - (Box Only) Sold in a 11" long, 14" high, 8-5/16" deep hands-on (non-enclosed) display box with a ORANGE backdrop panel. Top right corner of backdrop panel is marked, "8000 Asst.". This box has pastel colored clouds and Puffalumps in a hot air balloon on the front. FP8003SETA1986 - (Complete Set) Complete set in original box (Light Blue Puppy in Orange Box). WFL: 07-AF-09-1-A. FP8003BOXB1986 - (Box Only) Sold in a 11" long, 14" high, 8-5/16" deep hands-on (non-enclosed) display box with a BLUE backdrop panel. Top right corner of backdrop panel is marked, "8000 Asst.". This box has pastel colored clouds and Puffalumps in a hot air balloon on the front. FP8003SETB1986 - (Complete Set) Complete set in original box (Pink/magenta Puppy in Blue Box). FP8003BOXC1986 - (Box Only) Sold in a 11" long, 14" high, 8-5/16" deep hands-on (non-enclosed) display box with a ? backdrop panel. Top right corner of backdrop panel is marked, "8000 Asst.". This box has pastel colored clouds and Puffalumps in a hot air balloon on the front. FP8003SETC1986 - (Complete Set) Complete set in original box (Peach Puppy in ? Box). 1986 - Sold in #8000 Puffalumps Assortment. 1987 - Sold in #8019 Domestic Animal Collection. 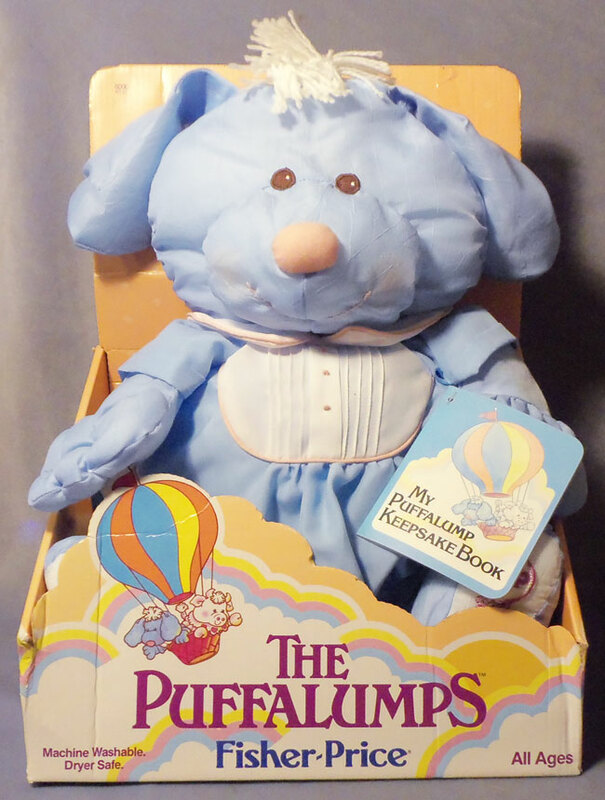 1988 - Sold in #8030 The Puffalumps Assortment.